Bethel Presbyterian Church Falfurrias Texas. 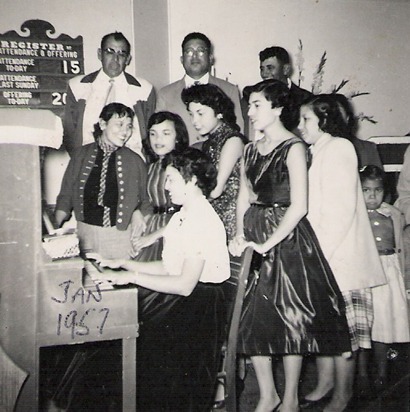 L-R, back row: Elders Ramon Guerra, Manuel Morales, and David Garcia Girl singers are Oralia Garcia; sisters Bess, Noemi and Eloisa Morales; and Elva Garcia. The pianist is Betty Morales. The little girl pouting on the right is Norma Guerra. 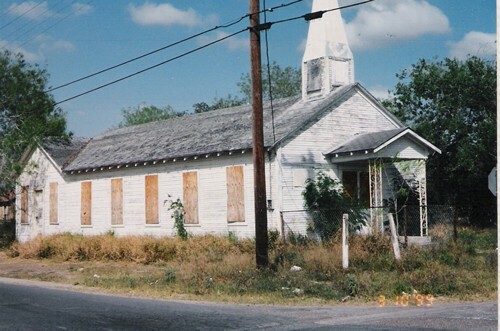 This church, predominately Mexican-American, was organized in the mid 1940s, flourished to about 90 members, and then declined in membership and closed in the mid-1980s. The remaining congregation moved their membership to the neighboring First Presbyterian Church. 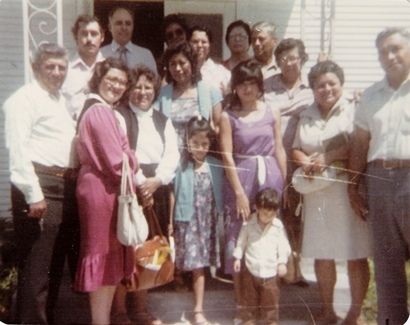 This is a small part of the congregation of the Bethel Presbyterian Church in the early 1970s. Among the members were the families of David Garcia, Manuel Morales, Ramon Guerra, and Ramon Navarro. David Garcia was the onsite manager of the nearby Las Palomas Ranch. Ramon Navarro is a 2006 Brooks County Commissioner.